​Dips, that is what will get you that big chest. Lots of dips! Dips are the main Push Exercise in bodyweight training. The make up Half of your Strength Training (more or less) but don't let that put you off. There are plenty of Variations to try once you master this basic bodyweight exercise. To do dips, all you need is some parallel bars. You often find them in the gym as part of the Dipping/Pull Up Frame - It looks like a giant Jetpack. Outdoors can be a bit harder, Bike Lock type frames make good improvised dipping bars, but with all of these outdoor gyms and bodyweight gyms cropping up, you can probably find something close to your home. Dips are Level 2 Push Ups. The only exercise you really need to be proficient in is a basic push up, say 10 or 15 good reps.
Don't pretend like you don't know what a Push Up is. You may be thinking that Push Ups are really basic, even too easy to build muscle, but there are so many different variations you can never really master it. Luckily you only need to be good at regular push ups to start on the dips. Ok, they aren't exactly a direct progression, in that they are the complete opposite movement pattern (a pull exercise). The reason I recommend these as a prerequisite is that they are Level 1 of Pull Exercises. Check out the full article on Rows. I always make clients balance push and pull movements, but I don't have that kind of control over you! But balance is key, it is that simple, Dips are Level 2 Push, Pull Ups are Level 2 Pull, so you pair them together to create balance. Likewise if you are doing push ups you should be pairing them with rows. In the same way, if you are doing Dips, you should be at the same level with your Pull Exercises. That is why Rows are a prerequisite. Now we have cleared the air with the Push / Pull thing, let's do some Dips. Get on the dipping bars, pop your legs out behind you so you are in the Supported Position. Like a Scapula Dip, straighten out your arms completely and depress your shoulders (Push Down into the Bars). Slowly lower yourself towards the bars keeping your arms tight to your body. You are basically trying to touch the bars with your shoulders. Pause briefly at the bottom of the rep to make sure you are stable and read to push up. Make sure your arms are tight and your in a strong position. Drive your hands down into the bar and exhale. Finish proud with straight arms at the top, remember that shoulder depression too. Do Not Relax Your Shoulders until you've finished your whole Set! When you are doing dips, keep your elbows tight to your body, just like push ups. it is a more natural movement for your body, so it will be more comfortable and you will be able to generate more force. Full range of motion is important in any exercise. The further you move the more you are going to be training your muscles it is that simple. So go all the way down and come all the way up. Another important training tip is to straighten your arms and really make the most of your shoulder mobility at the top of each rep.
Push all the way up with your arms, but like a Scapula Dip, make sure you are also fully depressing your shoulders. As I mentioned above, Dips are Level 2 of Push Exercises. In going with the 3 Movement Patterns, you will ideally be combining them with Pull Exercises. Pull Ups to be specific, as they are Level 2 of Pulls, making them the ideal pair for Balanced Training. These 2 exercises work your entire upper body, so these become the foundation of your bodyweight training. 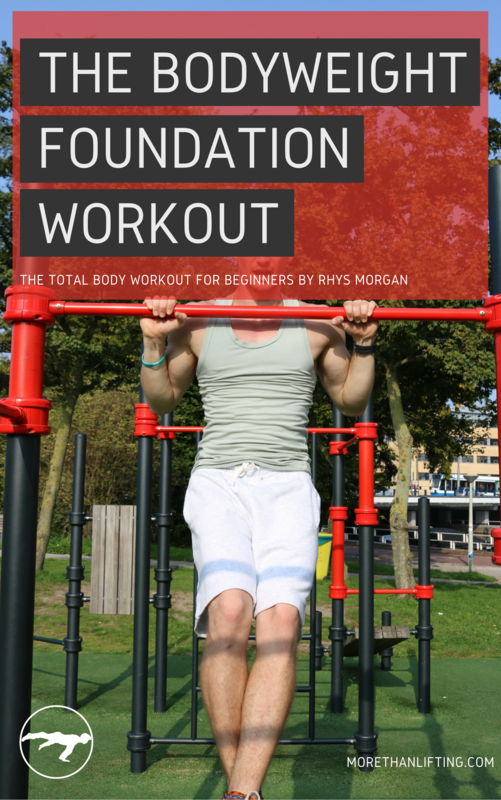 In fact, I have combined them and other beginner bodyweight exercises into a Total Body Beginner's Workout called The Bodyweight Foundation Workout. So Dips are too easy eh? You think it will be boring if all you ever do is Dips and Pull Ups? Luckily for you that is not all there is to bodyweight exercise. There are loads of variations of dips you can try out when you get good at these. You can check out this article for All of the Dip Variations I could think of, if you think you are ready. Oh, there is also this other thing called a Muscle Up. Its pretty amazing, it is a Push AND a Pull Exercise! See you later Dips, Im going to do it all in 1 Rep. Muscle Ups are hard though and they will take a lot of training to master because they are quite advanced. But there is no reason you couldn't get there with a little bit of will power and lots of reps.
Also If you haven’t downloaded the Foundation Workout get your hands on it Right Now! Full Exercise Guide and Warm Up included of course.